Explanation: Just as planets orbit our Sun, Jupiter's Moons orbit Jupiter. 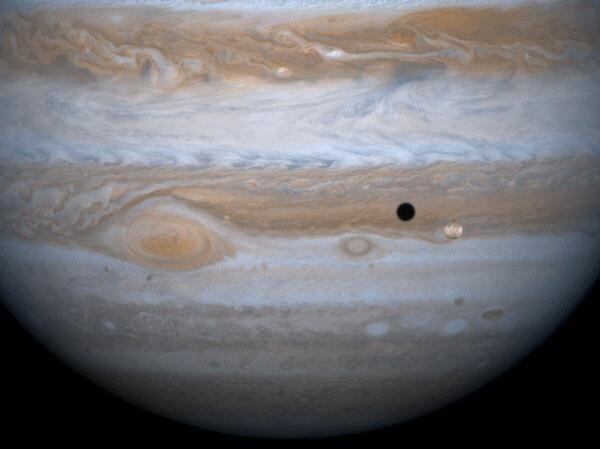 Pictured above is the closest of Jupiter's Galilean Satellites, Io, superposed in front of the giant planet it circles. To the left of Io is a dark spot that is its own shadow. The tremendous complexities that can be seen in Jupiter's banded, swirling atmosphere are being studied and may provide insight as to how Earth's atmosphere behaves. The above true-color contrast-enhanced image was taken two weeks ago by the robot spacecraft Cassini, currently passing Jupiter and on its way to Saturn in 2004. Engineers continue to study the Cassini spacecraft itself to understand why it required more force than normal to turn one of its maneuvering wheels.